I glanced at my watch for the third time, as if I expected time to start moving faster. It had only been a few minutes, but it felt like an hour. The lumbering railcars crept by while I sat in my idling car. I knew the wait was going to be longer than usual. The railway industry is on a campaign to rein in expenses and boost earnings. That means longer trains with more cars to boost efficiency. The demand for freight and rail services is up while companies are improving service. That’s good for business. 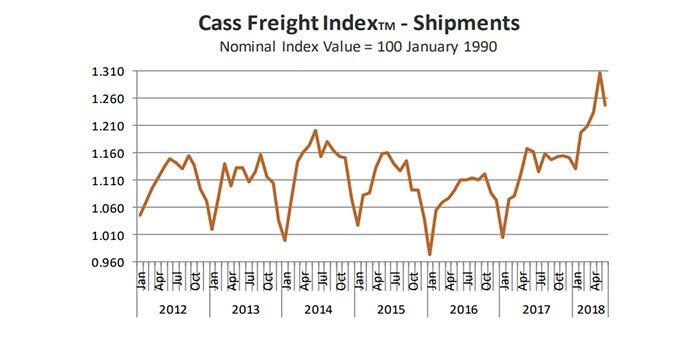 The chart below from Cass Information shows the huge growth in freight over the last year. While analysts worry that demand for freight may wane due to the trade war, higher oil prices suggest otherwise. The price of oil more than doubled since 2016. This drove an increase in shale and tar sands production across North America. There is a bottleneck in transportation holding back this surge in American oil. The pipelines that carry oil to the refiners and export terminals are maxed out. Producers have two choices: store the oil or find another way to get it to market. Shipping crude by rail is a costly alternative to pipelines, but higher prices are making it worth their while. The International Energy Agency (IEA) reported record exports of crude-by-rail from Canada last year. The IEA expects exports to double that amount next year. Following 2019, additions to the pipeline infrastructure will alleviate demand for crude-by-rail services. Meanwhile, the rail industry is starting to see internal improvements pay off. CSX, the main rail company that took major steps to revamp its services, saw record profits. Its earnings per share (EPS) is up 58% since last year! CN, a major rail service between Canada and the U.S., grew its EPS by 30% since this time last year. Railways are set to continue their earnings growth. Canadian National Railway Co. (NYSE: CNI) and CSX Corp. (Nasdaq: CSX) are both set to see increased demands for their rail services over the next year. « Previous What Is AeroVironment and Should I Invest in Its Stock?